Our radio broadcasts provide biblical wisdom to hundreds of thousands of people worldwide every week, proclaiming the gospel and encouraging believers in their walk with Christ. Every day, over 20,000 people visit our website, finding help and hope in the countless articles, books, online courses, radio programs and other practical and biblical resources to strengthen their marriage and family. But we know that there are more families that need help. And we know Christ offers the help they need. Your gift to FamilyLife empowers a movement of ministry to help families in life’s most important relationships: God, spouse, and kids. 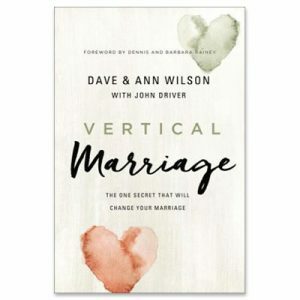 When you make a financial gift today, we’ll send you a copy of “Vertical Marriage,” the new book from Dave and Ann Wilson, the new hosts of FamilyLife Today®. It’s a powerful book that will help you get to know the Wilsons in a deep way. We appreciate your partnership with FamilyLife!